Well, it’s mid-March, and it’s still a regular chill-fest here in Southern California! I’m loving it—I’m in no rush to get to those 100 degree days we have in the Summer—and I’m thrilled that my outerwear collection is seeing some regular action. 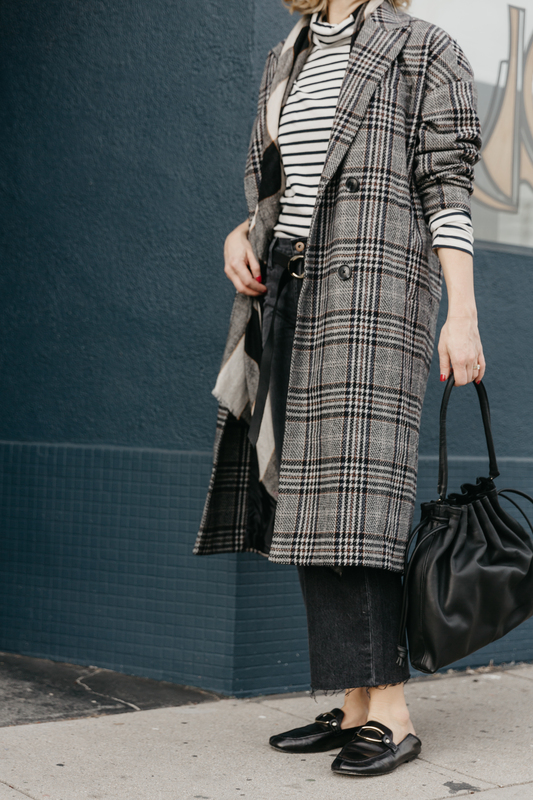 This is the second-to-last in my winter style posts, but it wouldn’t take much to transition this look right into Spring. That’s because, in my humble opinion, plaid and stripes are seasonless when teamed up together, since the pairing evokes a sense of fun that is always a fashion DO! There’s other reasons that this combo feels very now, of course. For one thing, the shapes call to mind the same oversized 80’s-inspired silhouette that I’ve spotted on my fave street style icons. 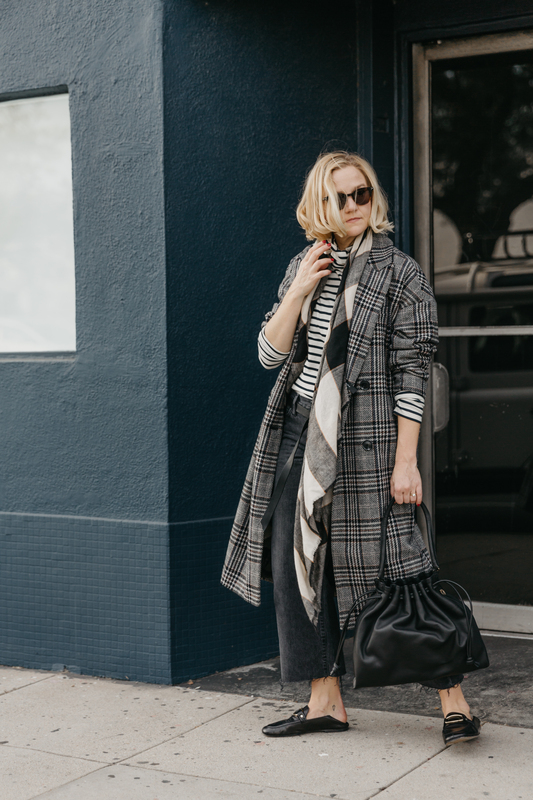 (I definitely felt like a lady version of John Cusack in ‘Say Anything’ when I slipped into this slouchy plaid coat!) The sailor striped turtleneck is a freshened-up version of a classic, what with its slightly boxy, cropped fit. And speaking of cropped, I’m so into jeans with a wider leg and just-above-the-ankle length. They’re the updated take on the boyfriend jean that we’ve all been waiting for! Little extras like loafer mules and a drawstring bag complete this on-trend (yet not overly trendy!) 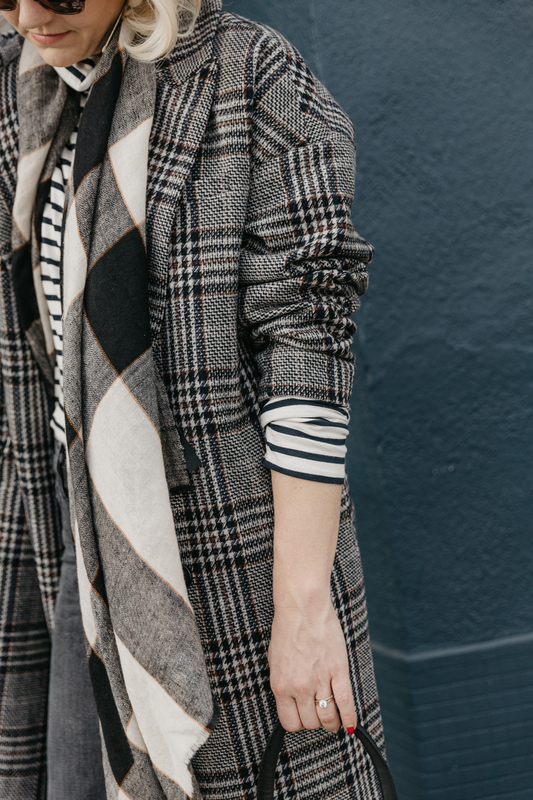 outfit; and an oversized scarf that echoes the plaid print of the coat completes a pattern-tastic look that never gets old!